Room Rate : JPY30,000 per room per night based on double occupancy including breakfast and JPY200 donation to Okinawae Rail protection fund. Your pets, up to ONE doggie per room, will enjoy free stay. Your 2nd and more companion will be charged JPY2,000 per dog per night. 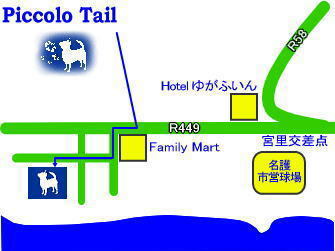 Take R449(Motobu-Coast Line) from Nago. Make left turn at the corner nearby "Family Mart", approx. 1km from Miyazato Xing. 2 min. Cab ride to Piccolo Tail. approx JPY500.